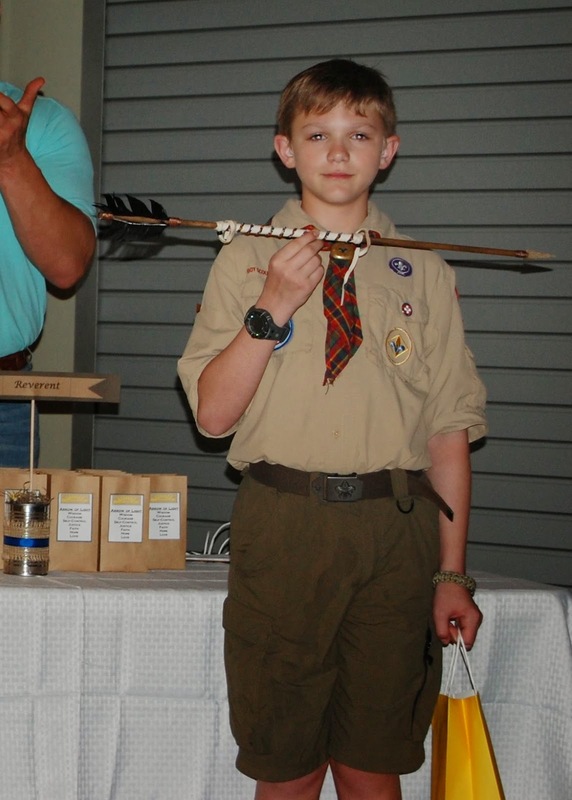 The Troop 50 family is growing as a result of two recent Arrow of Light crossover ceremonies. We're delighted these Scouts have chosen to continue their Scouting journey into Boy Scouts, and that their Trail to Eagle will include Troop 50. Many of our new Boy Scouts have already been attending meetings and activities while Webelos Scouts, and we're excited to make them official Boy Scouts in our troop. The first of these ceremonies was Pack 811's, conducted on March 16 at Auburn University's Ag Heritage Park. At that ceremony, Liam became Troop 50's first new Scout of 2014 as he crossed the bridge into Boy Scouting. The second ceremony was Pack 29's, conducted on April 5 at Auburn United Methodist Church. The ceremony included nearly 20 Webelos Scouts from two dens, and 10 of those chose to join Troop 50. In addition to being represented by the Webelos joining the troop, the ceremony also included two founding Scouts of Troop 50 — Andrew and Davis — who appeared as two of the four Native American principals who each represented one of the four winds — North, South, East and West. At the end of the ceremony, Webelos were escorted to different areas where each of the troops receiving their new Scouts were stationed. Both Andrew and Davis earned the Arrow of Light as Webelos themselves and are alumni of Pack 29. For more photos from the Pack 29 Arrow of Light Ceremony, view the troop's online photo album. Scouts Davis and Andrew, and Ryan. We're excited about the addition of our newest Scouts and wish them all much success on their Trail to Eagle!